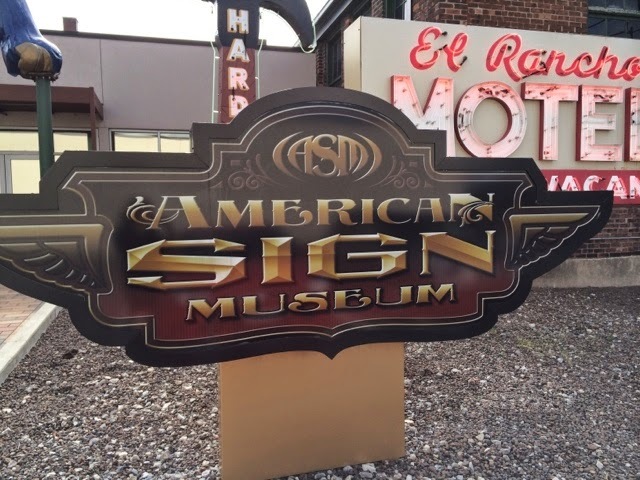 I started out in Cincinnati, Ohio -- where, because the Flying Pig expo didn't open until noon, I paid a visit to the completely amazing American Sign Museum. Inside the museum it was a little overwhelming -- some great classic signs, lots of info on pre-electric signs, and then, bam: neon all over! 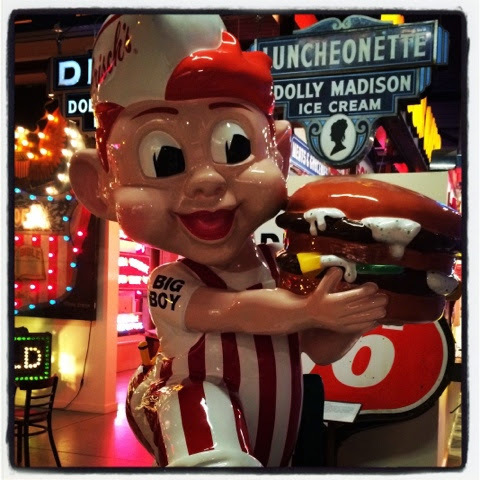 This reminded me of my childhood -- there was a Big Boy on Aurora when I was little. 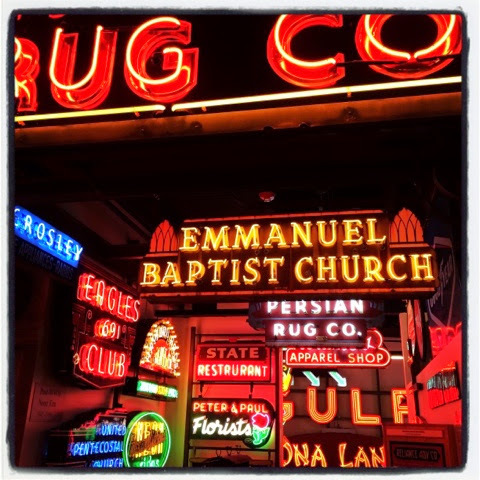 My favorite part of the museum was "Main Street", which featured shop fronts, a working neon studio, and some massive neon signs. 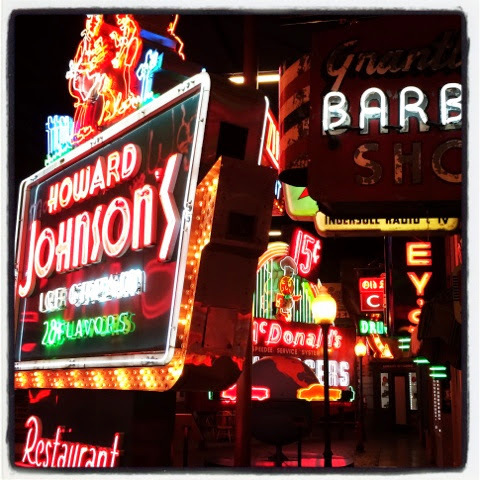 I was a little surprised at how noisy the signs were -- you could hear the machinery inside making the lights flash. Then I made my way over to the hotel where packet pickup was being held. 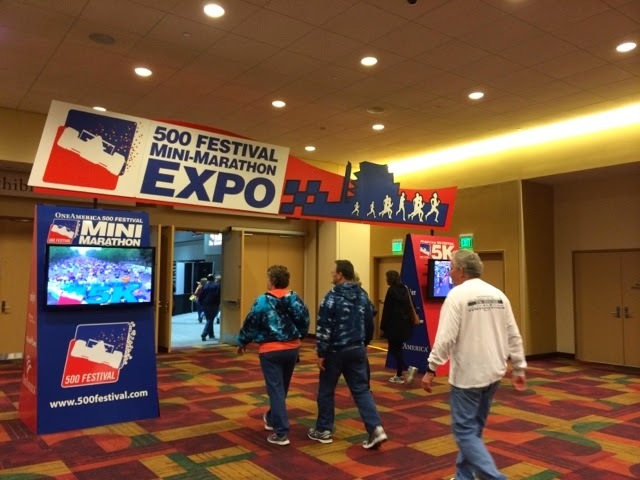 This year they split the expo into two buildings -- a hotel ballroom to pick up your bib and bag, then the convention center across a skybridge to pick up your swag and visit the other vendors. I got in line at around 11:30. 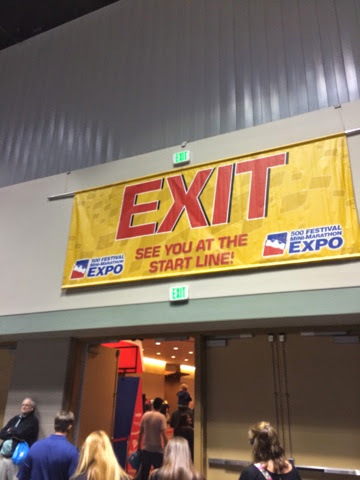 People were grousing that the expo didn't open until noon ... but, of course, that was when they *said* they would open, so I don't know why people were complaining! But here's the thing -- the organizers opened the doors early... at around 11:40. 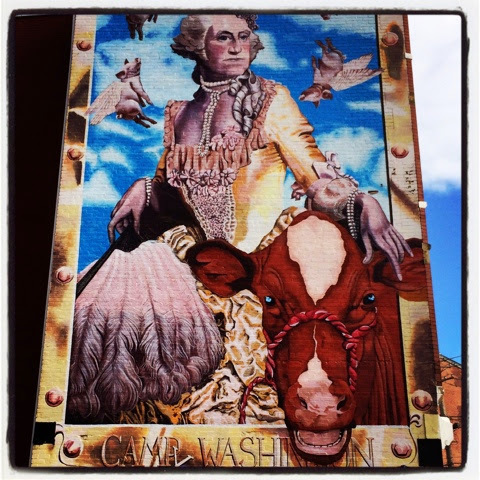 Nice touch, Piggies! 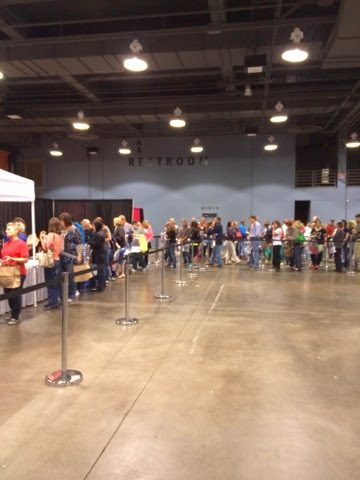 Packet pickup was pretty well organized -- bibs by last name, nothing complicated. 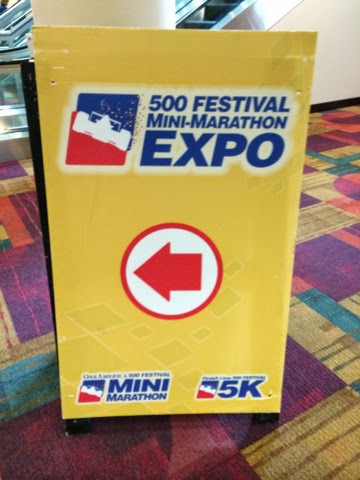 I had forgotten that there were multiple events -- a 5K, a 10K, a half, and a full. No wonder they have so many people! 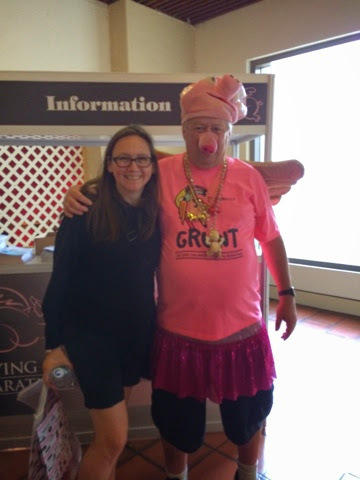 On the way over to the main expo hall I ran into this gentleman, who was the first person to ever register for the Flying Pig, years ago, and who will be running his 150th marathon on Sunday. Yeah, he'll be running with the pig hat and the gold wings! I also want to point out that the volunteer shirts like the one he is wearing say "GRUNT" on the front. GENIUS. On the way to the expo hall I passed lots of coloring contest submissions, plus some of the swine signs for individual runners (didn't spot one for me, but I'm hoping! 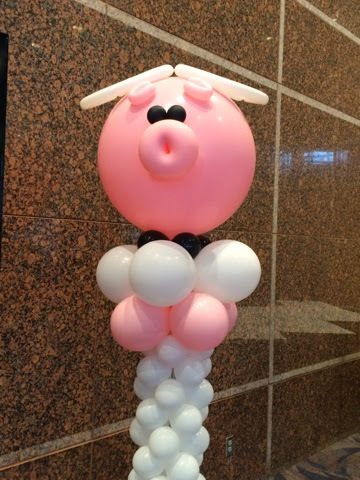 ), some cute motivational signs, and (best of all), BALLOON ART. 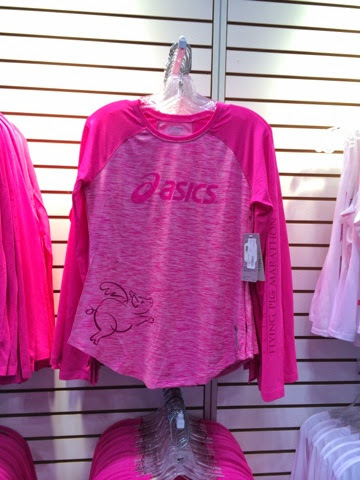 Inside the main hall, the Asics merch was super cute and quite varied. Loved these "baseball shirts" with the pig logo on the right hip. They also were offering the ability to print any graphic on any shirt -- interesting option, and a great way to keep from having too much stuff left over! I nearly joined this line by accident -- I thought it was shirt pickup. 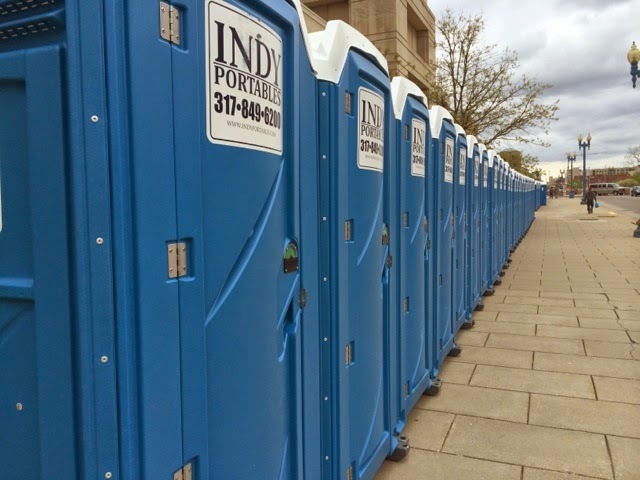 But, nope -- since the race is sponsored by P&G, if you wait in a long line you're allowed to walk through and pick up products like detergent, dishwashing pods, deodorant, shampoo, etc. etc. Given that I'm traveling with just a carry-on, it didn't make sense to pick up a bunch of big stuff, but clearly people were excited. In another part of the expo, Iams had a big display... but I really didn't need dog food! 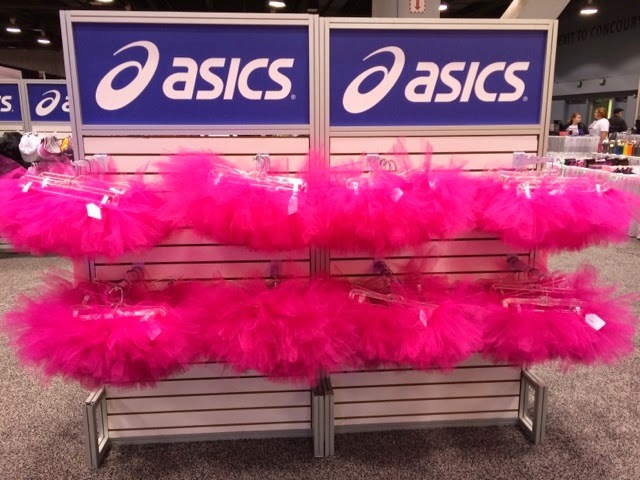 There were plenty of other vendors, local running stores, etc., but I of course didn't need anything, so I was on my way in under an hour. 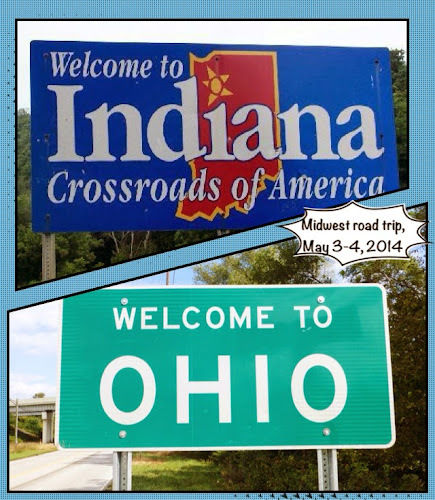 Drove to Indianapolis, got a teensy bit lost, but eventually found my way to the Indy Mini expo. Yes, these helped! The Indiana Convention Center is massive... but eventually I found the actual hall. 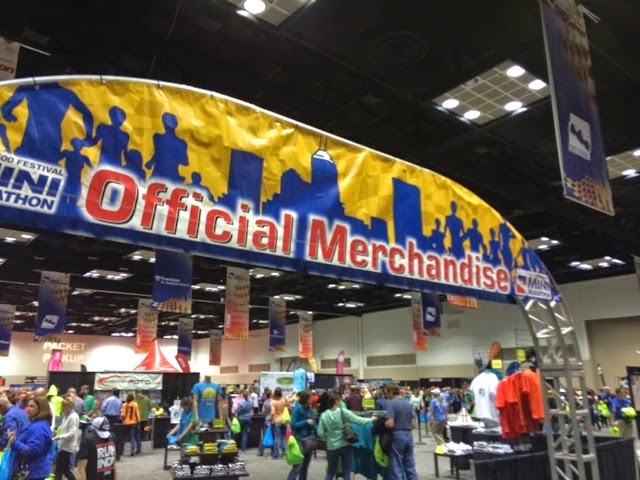 Was a little surprised that the largest half marathon in the world has such a small selection of merchandise... a few shirts, some mugs, keychains, and a sticker. 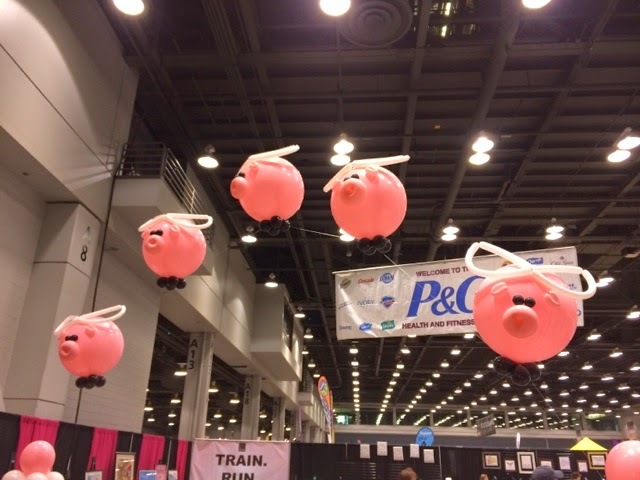 Of course, I may have arrived to slim pickins, given it was the afternoon of the second day of expo! It's funny -- I got a little lost in the expo hall since it was so open -- not the usual pipe and drape corridors! I wasn't even sure where to go to pick up my bib and shirt -- though as you can see from the picture above, it's well labeled at the back of the hall! 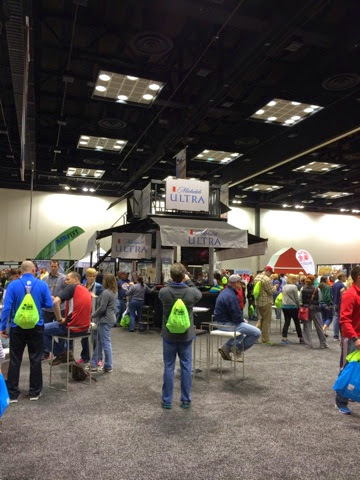 Flying Pig definitely had the flashier expo -- bigger sponsors, bigger booths, and a visit from Ryan Hall. 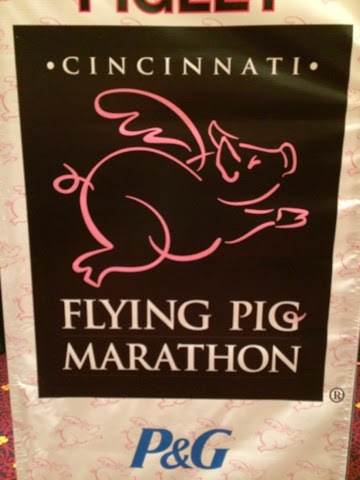 Flying Pig also had way better merch, and excellent branding. The simple act of keeping -- and using -- the same logo each year, but adding a new theme each year gives them a lot to play with. 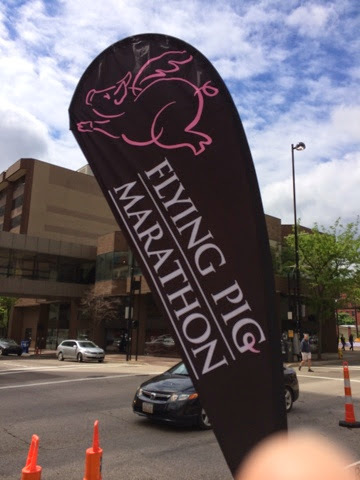 Merch and branding advantage go to Flying Pig. Indy Mini had a lot going for it. 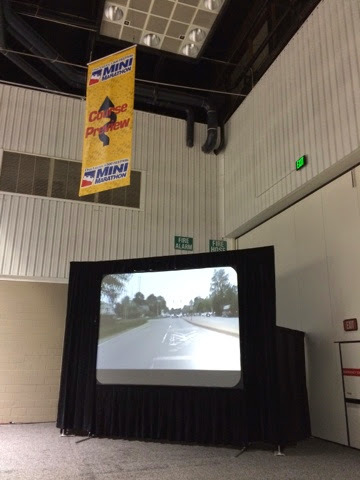 I loved this big screen showing video of the course. It was nice to have a preview of what I'll be running tomorrow, and seeing the lap on the track made me pretty giddy. I'm super excited about that! 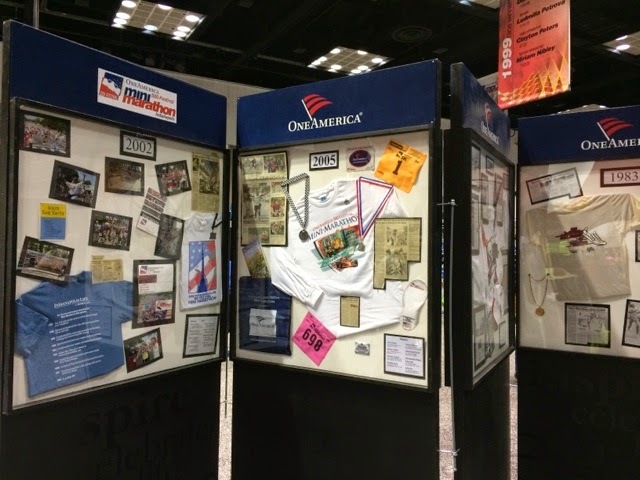 Another really nice touch: historial displays of every previous Indy Mini, with shirt, medal, photographs, and news clippings. 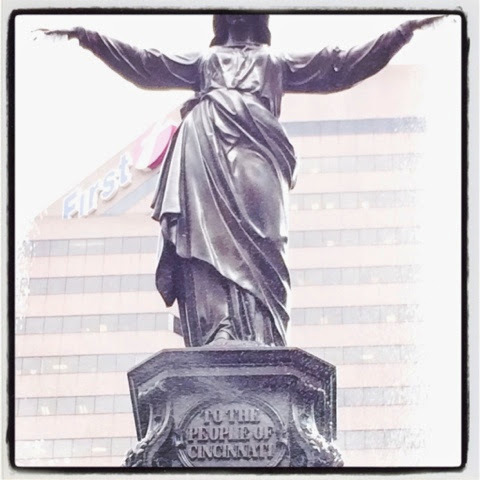 I liked seeing how things had changed over time. For celebrating their own heritage, advantage Indy Mini. 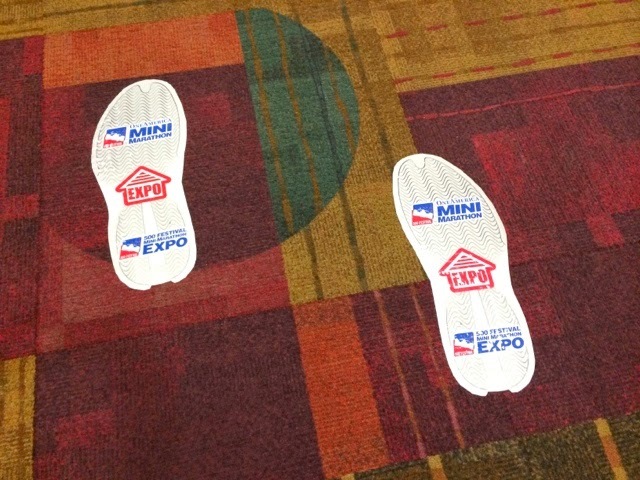 Overall, the Indy Mini was a smaller but easier to navigate expo, and had more experiences that I liked. But even with that, I didn't stay all that long. 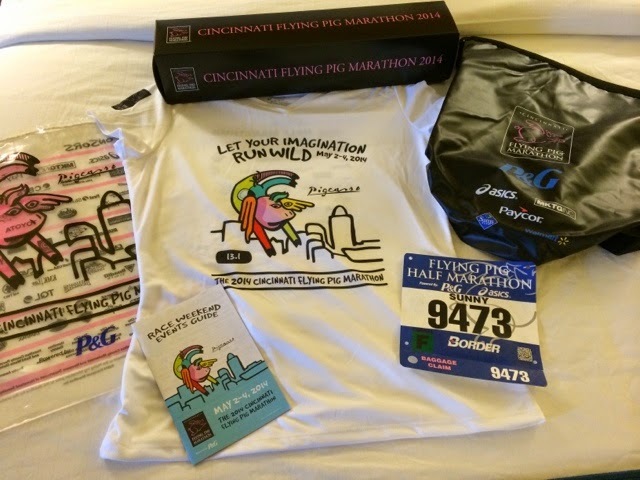 Event shirt, gear check bag (the clear one), program, bib (personalized, nice), and a lithograph (in the black box) and something that was referred to as a "premium". It's a heavy black vinyl (?) bag... possibly waterproof? Not sure... but there you go. The shirt is a nice Asics tech tee, gender specific, but a bit oversized somehow. Luminous yellow string bag, embroidered hat (surprise! ), bib, and a surprisingly handsome long-sleeve tech tee. The tee is soft, feels like cotton but is clearly techy. The front is nice and subtle, and the back has a cute print. I'm not a big fan of red, but this is one of the nicest race shirts I've ever received. 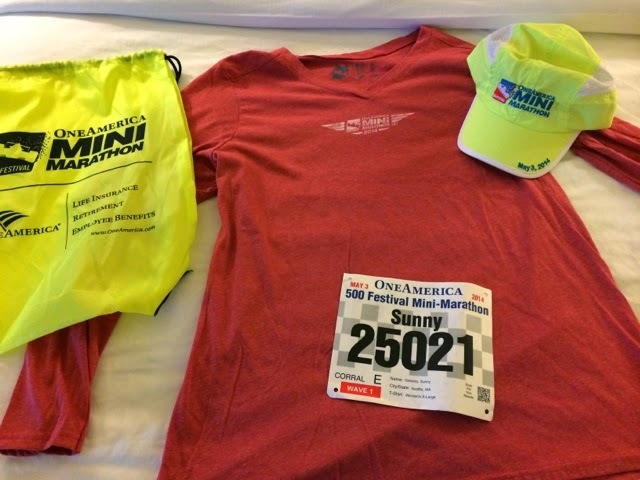 Okay, here's my outfit for tomorrow's race! 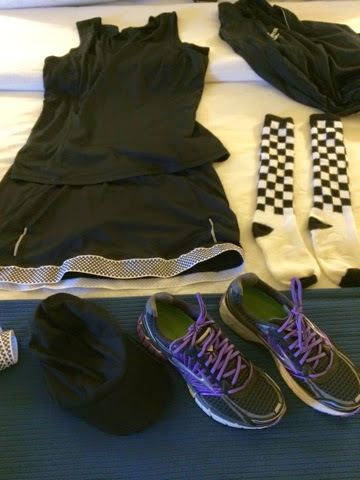 Black tank, black Brooks skort (customized with checkered ribbon at the hem), checkered knee-highs (yeah, this is risky, but I'm going for it), black Brooks hat, and of course my beloved black and purple Brooks Adrenaline GTS 14s. LOVE this color. I've got a lightweight long sleeve as well as my LSD Lite Jacket in case the weather gets weird tomorrow, but otherwise I feel all set. Alarms are set, clothes are laid out -- now up the wooden hill to bedfordshire for me!